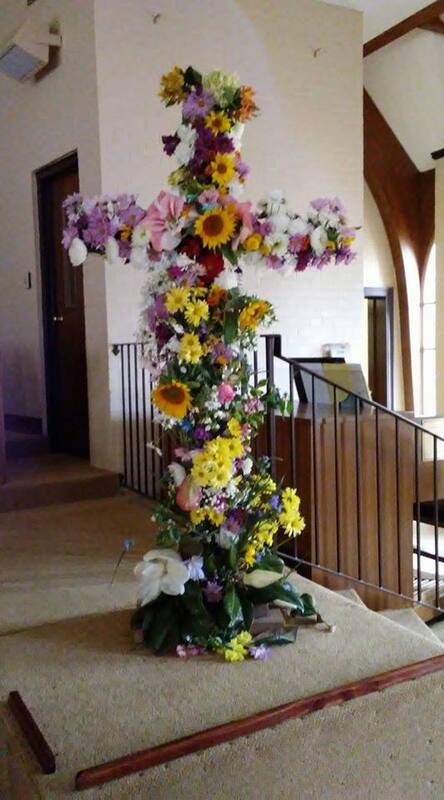 We have a wooden cross made with 2x4s covered with chicken wire at my church, University Baptist in Hattiesburg. On Easter Sunday everyone is encouraged to bring flowers to decorate the cross. We worried there wouldn't be enough flowers this year because our azaleas bloomed early and are gone. 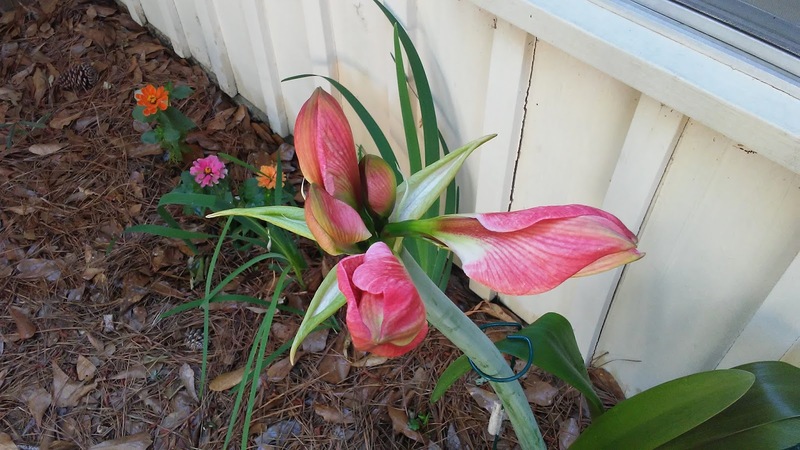 But people brought every other kind of flower imaginable--from tiny Lantana to volunteer sunflowers to our state flower, the magnolia with its shiny green leaves. What a glorious sight! 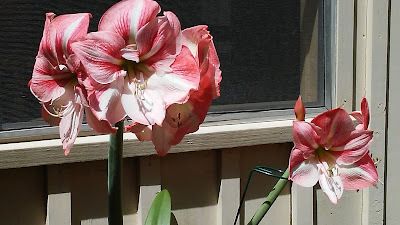 A good place for some of my amaryllis, too. 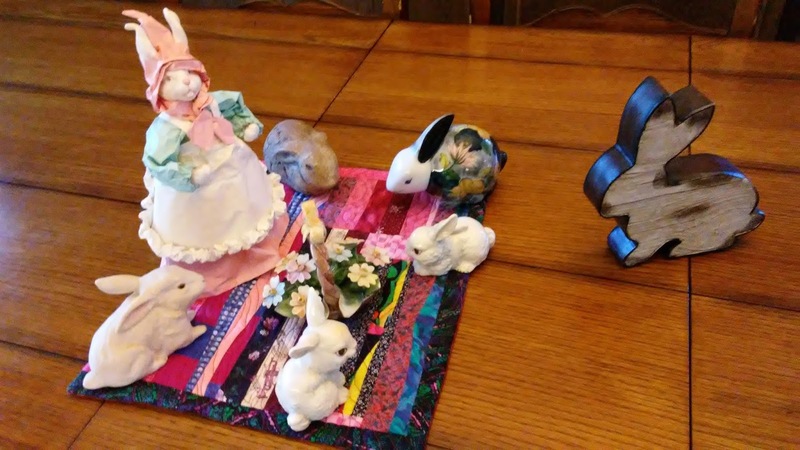 No Easter egg dyeing here, but a few of my rabbits moved to the dining room table. I've been enjoying documenting the progress of my apple blossom amaryllis, which has rewarded me with two scapes this year. I've posted several pictures on Facebook, and will repeat them here. 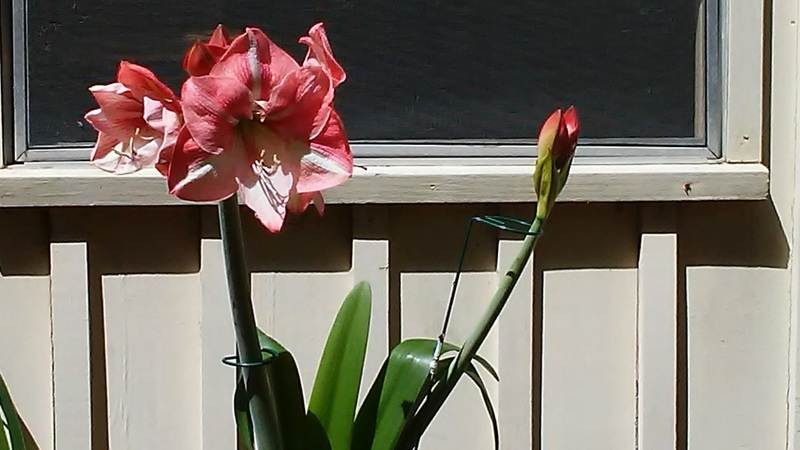 There are five blooms on one scape and four on the other. 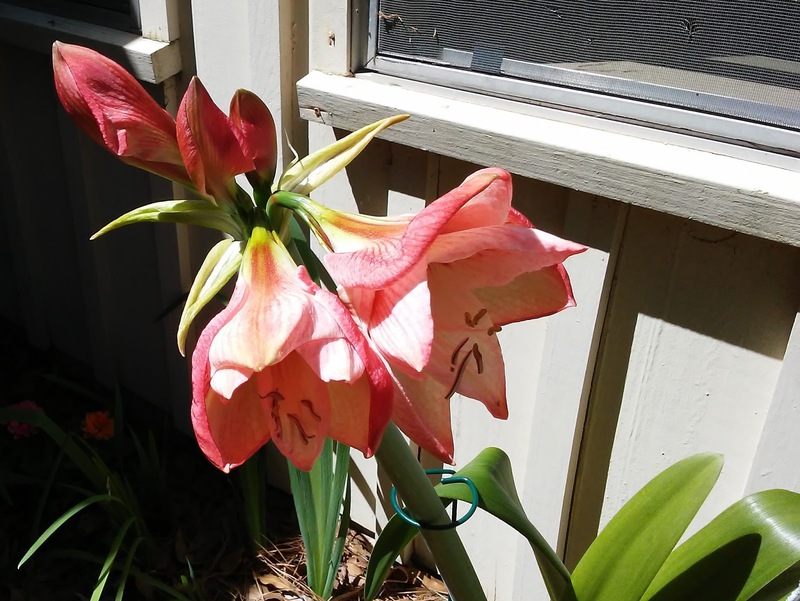 They open gradually, and I will be enjoying them for several weeks. 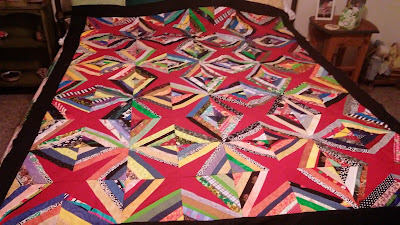 My passion for scrap quilts and string quilts got a workout with the completion of this red star string quilt. It is patterned after one I saw that Joan Alliston had made with black stars and red border. 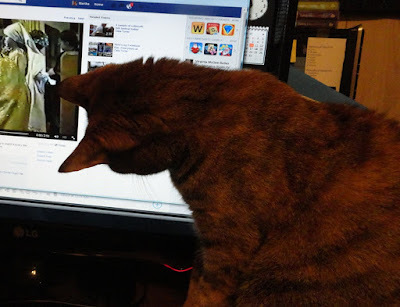 RahRah was fascinated with the computer screen when she was a tiny kitten. 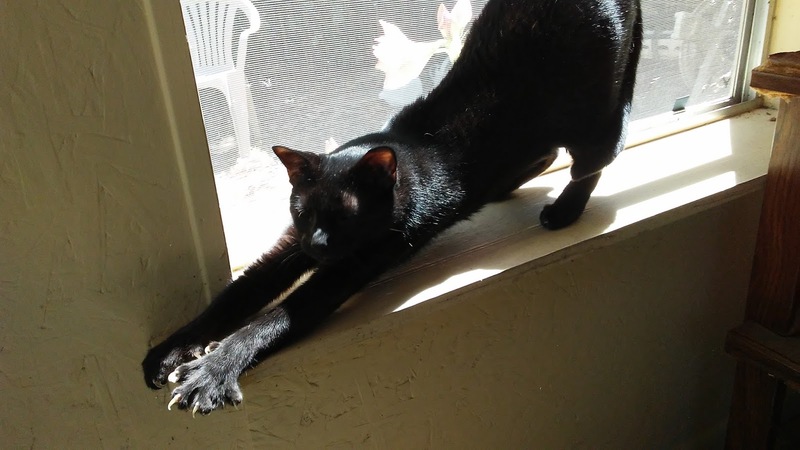 She has not outgrown this interest and loves to stretch up to the top of it whenever I am sitting at the computer. 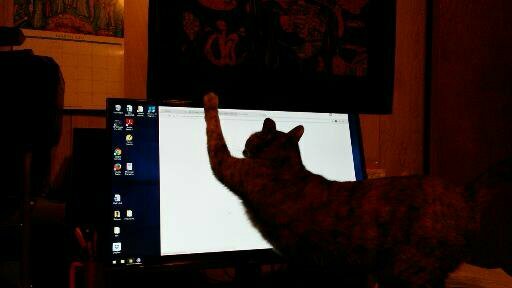 Meanwhile, back in the studio . . . 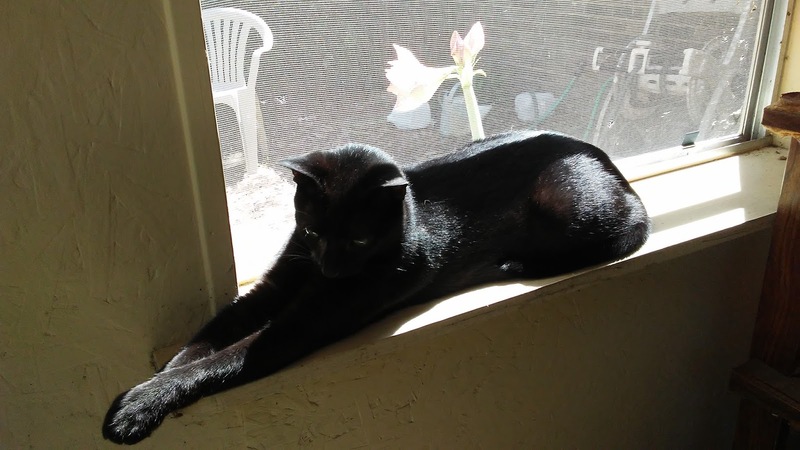 I have finished a project that was very difficult but very rewarding. 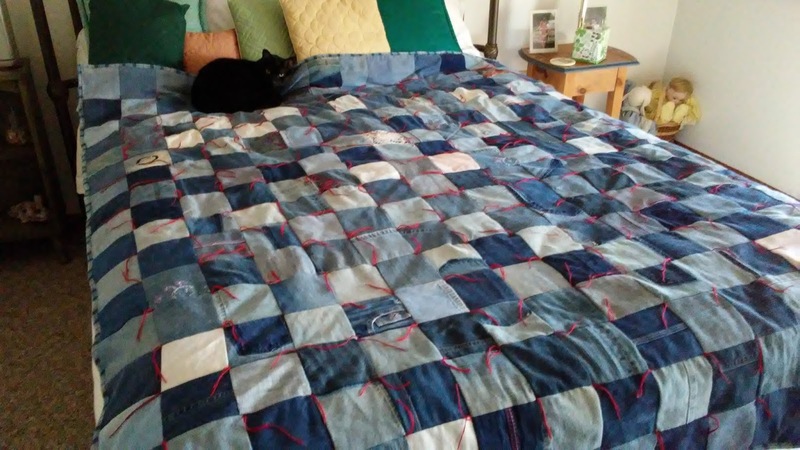 Several years ago a friend and neighbor asked me to help her learn to make quilts for her grandchildren from their blue jeans as they graduated high school. I gladly taught her what she wanted to know, introducing her to mats, rulers, rotary cutters and other innovations. She died unexpectedly in December and I asked one of her four daughters about the quilts and said I wanted to help complete the two in progress. Six had their quilts, and there were two seniors this year. The quilts tops were nearly complete, and the daughter helped as I added the remaining squares, layered with thin batting and flannel, and stitched red crochet thread at the intersections for tying; then I added the binding and turned them over for the family to tie all the crochet threads. 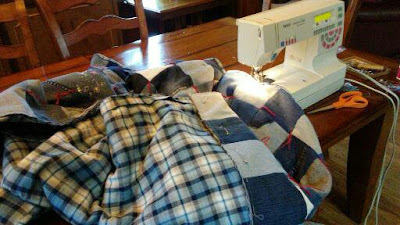 I moved the sewing machine to the dining room table to help deal with the weight and bulk. 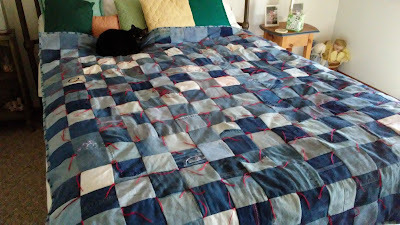 I could not have done these without help, and we marveled at Jo having already done six quilts by herself. The youths treasure these gifts from their grandmother, each with his or her name embroidered in a corner square, and it was a real blessing to me to be able to finish a quilter's dream and carry on a family tradition. 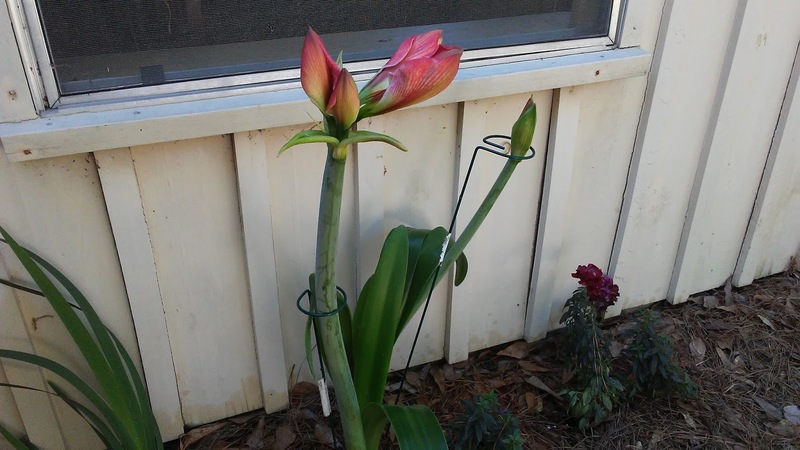 We all worry about leaving unfinished projects stored in closets, so this felt good! 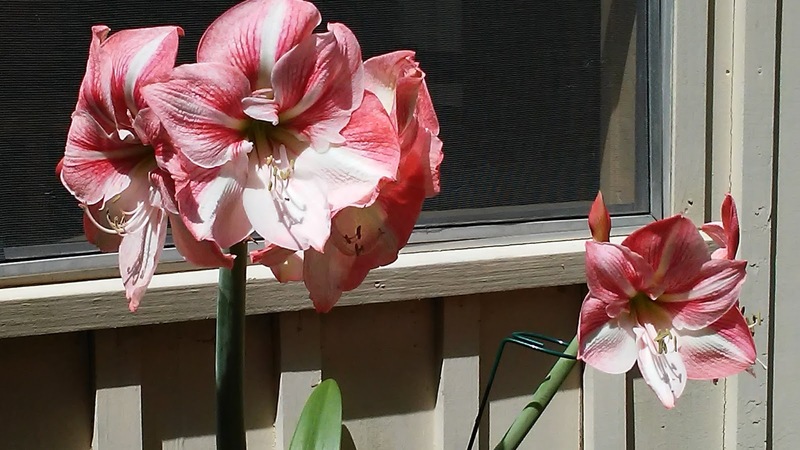 My apple blossom amaryllis is about to put on a show...five blossoms on one scape and another scape is coming up, meaning the bulb has multiplied. Isn't it marvelous what sometimes happens when we just leave things alone and let Mother Nature do her thing? The bulb was a gift about 6-7 years ago, and after it grew very tall (too tall!) with six blossoms in a pot, I planted it in the flowerbed where I can see it from the kitchen window. 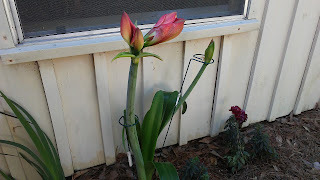 It has bloomed every year with three or four blossoms, but at a good height. I do feed it a few times during the year and mulch through the winters. 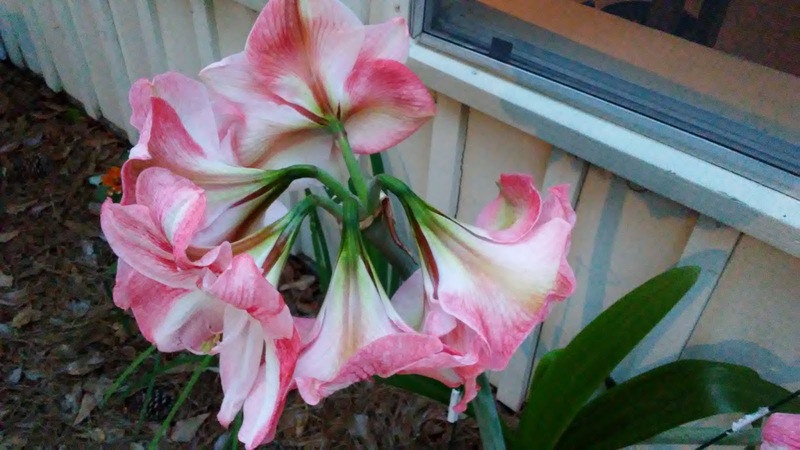 I'm so happy to have it multiply! A beautiful Easter message. Tarbaby is sunning himself on the window ledge inside.